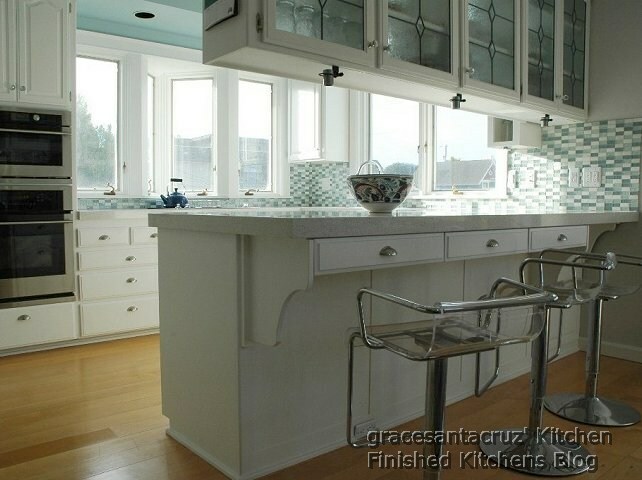 Cabinets: existing oak cabinets were painted with Kelly Moore Durapoxy eggshell finish in Swiss Coffee White. Countertop: Caesarstone 6600 countertop in Nougat. Quartz embedded stone crystals offer polished shades of grey that match the stainless steel and any shade of white in the kitchen. Mitered eased edge hides any seam with the 2 1/4-inch edge. 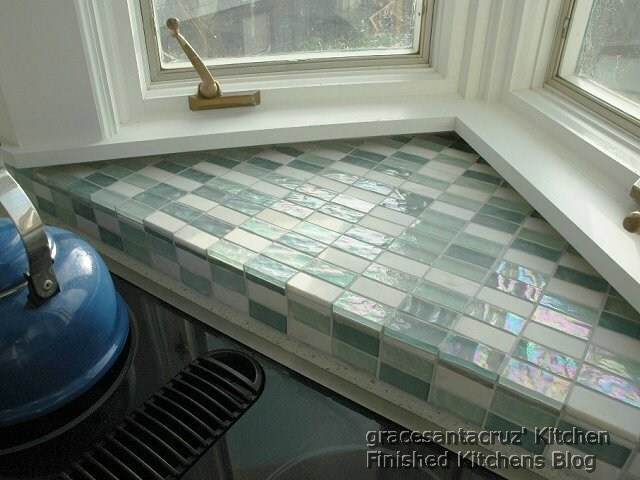 Backsplash: tiles are Hakatai, Emperia Series Celestial mosaic blend TR640 - 2 shades of iridescent glass with white marble. Bar sink faucet: Hansgrohe Axor faucet with triple undercounter water filter. Refrigerator: Jenn-Air white "floating glass" side by side. Cabinet was deepened to match the standard depth refrigerator so it appears cabinet-depth. Ovens: GE Monogram. Top Advantium oven doubles as a 2nd convection oven or warmer, plus still a microwave. Bar stools: Fancy chrome and acrylic bar stools found on ebay. Wall paint: blue is "Hatteras Haze" from Kelly Moore. The other wall (goes into dining room area) is "Abalone White" from Behr. 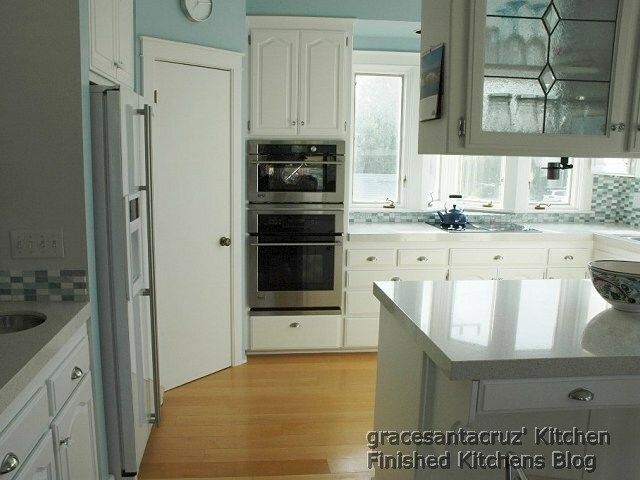 We updated what was a mid-80's top-of-the line kitchen to a 2009 kitchen. 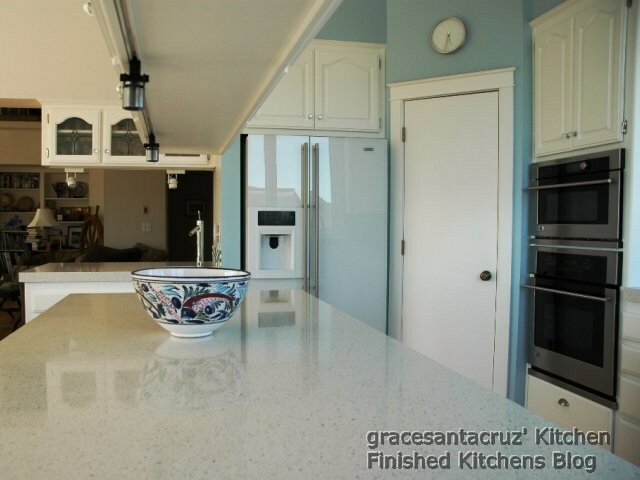 We replaced the appliances, painted the oak cabinets, and replaced the 80's ivory colored 6-inch tile countertops and backsplashes. 1) We kept our original cabinets by painting them. 2) We purchased all the appliances online and found good deals including no tax. 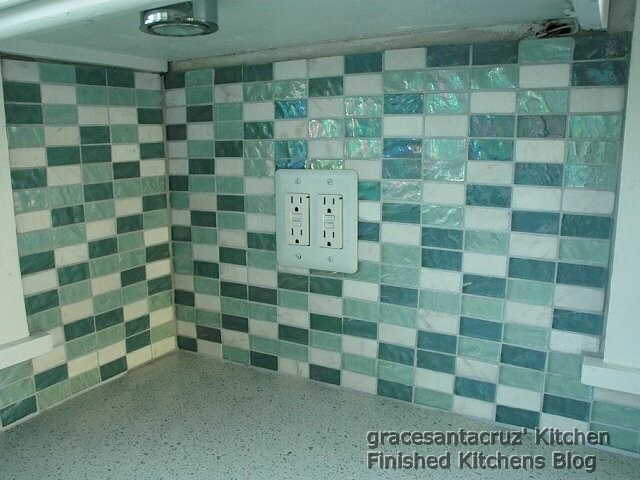 3) We did some DIY: backsplash, most of electric works, plumbing, and did not hire a general contractor. 4) Our painter is the fastest, most thorough, very affordable wonderful professional. He did the most tedious part of removing the wall papers and all the painting, which would have taken us months. Cabinets: Painting the existing cabinet was another big decision. It is solid oak but after 25yrs, it was looking dingy. Our painter to use eggshell rather than semi-gloss swiss coffee, which turned out to be crucial. The Eggshell finish gave us much softer, classier tone. (i.e., looks more expensive). I was worried about stains and dirt on white cabinets, but because the dirt and stains show clearly, I can just wipe it with soapy sponge and in 2 seconds, they are gone. This kitchen feels like the beach. Pristine and serene. Beautiful.